Soldiers of Fortune is the second book in the series authored by Joshua Dalzelle. The book begins fourteen months after events that took place in Omega Rising (see my review) with the band of unlikely comrades still trying to keep one step ahead of their enemies. Omega Force, as they are now known, have only one guiding principle; To help others that don’t have the power to help themselves. The start of the book sees them on a mission attempting to rescue a Senator and his family who are in danger from the current political regime in control of their planet. Omega Force impress their task master so much that they are immediately hired again, this time to investigate a series of violent attacks on civilian vessels travelling the shipping lanes between a group of star systems known as the Concordian Cluster. They decide that the best way to investigate the attacks is to try and infiltrate the seedy underworld that forms part of the Cluster. After kicking their heals in various spaceports trying to gather intelligence, and making a series of false starts leading nowhere, they finally get the break they need and find employment with a group potentially involved in the attacks. Working undercover and being out of touch with their allies, Omega Force must draw upon their collective skill set in order to uncover who is responsible for the attacks and try and intervene. 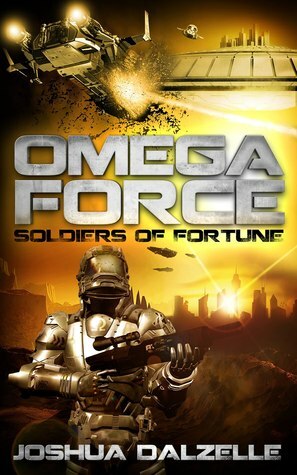 After enjoying the first book in the series I was keen to reacquaint myself with the mismatched bunch of mercenaries who call themselves Omega Force! On the whole I wasn't disappointed with Soldiers of Fortune. There's plenty of action at the start of the book and an abundance of it as the book comes to an exhilarating climax, although I did think the story fell a bit flat in a couple of places in the middle. There is plenty of humour between the team members giving the impression that as well as being work colleagues, they are also close friends. There's even a smidgen of character development, not a lot admittedly, but some is better than none at all. My only real criticisms are that some of the interactions between the team members sometimes feel a bit forced, and that some seemingly impossible situations are occasionally resolved somewhat unbelievably. However, I'm a sucker for a fast paced science fiction yarn, and feel I'm becoming better acquainted with the crew of the Phoenix. Therefore I'm very keen to read more about the adventures of Omega Force in the future.